Keep Off The Grass, The Dark Light’s debut album, released April 6th on the Unknown Pleasures label, distributed by Cargo Records, is described as a deeply melodious, intoxicatingly moreish collection of consummate, timeless, rock ‘n’ roll infused music concoctions. The album contains ten flawlessly composed, dirty guitar driven songs, all boasting big choruses and immediately hummable, harmonious tunes which won’t get out of your brain once they’ve inevitably worked their way inside. The Dark Light were formed in London by single minded Italian guitarist Marco Simoncelli, who fell in love with rock when he discovered Nirvana and subsequently Led Zeppelin as a boy while growing up in Rome. After playing a in a series of local bands, he formed his own outfit Rewild, who won support slots with Iggy and The Stooges in Rome and Milan after the Stooge’s Sax player Steve MacKay was sent a link to their songs. But nothing much else ensued, so he moved to London in 2013, determined to form a new band to make outstanding music in the greatest rock ‘n’ roll city in the world. Finally, after a year and a half of trial rehearsals with potential vocalists, he clicked with scouse singer / songwriter Gerard Edwards three years ago. Gerard, who was born in Liverpool, had emigrated to New Zealand aged 8 and then returned to Liverpool in his early 20’s. A big Beatles fan, Gerard had spent three years playing in cover bands locally, plus acoustically on his own, with covers all stripped back to basics, before deciding to relocate to London. Marco and Gerard soon began writing songs together, (often while watching football, another joint passion), and with an earlier band line-up, even recorded some tracks with Grammy award winning producer Liam Watson (White Stripes, Supergrass, Tame Impala) in Toe Rag Studios in Hackney. Unimpressed with the results, Gerard and Marco stood the former members down, learnt from the experience and began looking for musicians once more. 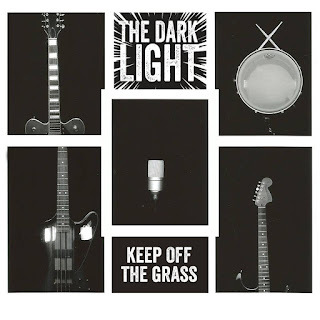 ‘Keep Off The Grass’, which was produced by Shuta Shinoda and Marco Simoncelli in Hackney Road Studios and then mastered by John Webber (Bowie etc) at Air Studios, is all set to beam The Dark Light into rock’s heady stratosphere.